Keeping secrets isn't my speciality. It never has been, ever since kindergarten when I found out Becky Swanson had a crush on Tommy Barnes, and I managed to circulated that fact to the entire class, including Tommy himself, within our fifteen minute recess-a pretty impressive feat, in retrospect. That was ten years ago, and it still may hold the record for my personal best. This book really surprised me. I had read the author's first book and it hadn't caught my interest as much as other people's, so I was slightly blasé about Speechless. 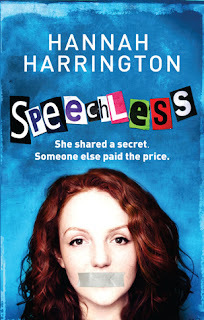 What I found from the very first page of Speechless, was a very powerful book with an extremely strong opening that shows the reality of bullying and gossip that occurs so frequently in schools these days. The author has captured the internet/phone bullying era perfectly. Chelsea comes across as shallow to begin with. She lives and breathes for a good bit of gossip, regardless of how it might hurt someone. Until the inevitable happens and her big mouth leads to someone nearly losing their life. Chelsea is fully aware of who committed the crime and realises that this time, she needs to open her mouth to tell the truth, even if it means she will be bullied by everyone at school. As soon as Chelsea tells the truth and takes a vow of silence, you see her begin to transform from mean girl, into thoughtful, kind hearted girl. She learns the true value of friendship as the people who should really hate her, become her real friends. Her previous group of friends come across as superficial and flat and it shows they were definitely not worth knowing. I loved Sam! He is the original gorgeous geek. With his glasses and eclectic dress sense, he just came across as completely gorgeous. And I adored the diner. It took me back to university days when I spent every spare minute working in an American diner. Chelsea really suffers at the hands of the bullies. How she stayed strong throughout the bullying I honestly don't know. The book has a Pretty In Pink feel to it, especially with Chelsea attempting to make her own clothes. These are the first YA female characters who actually have hobbies that I would enjoy! I think this book should really be on every teenager's reading list. It highlights just how wrong bullying is and would make a great study book for PSHE. Fab review - I really liked this one! Aw thank you Jim. Really appreciate the tweet too. Thanks Anya. YOu will really enjoy it. This does sound like an excellent book for teens! I think they could learn a lot from it. Im glad you enjoyed this one Viv, I really did too but so many people seem not so keen on it!